Life in the Mexican desert is, at its very best a challenge. The basic requirements for survival, food, shelter and water never seem to be in surplus. Therefore, nothing here ever passes on a chance for a meal. Adaptability, and seasonal knowledge are all part of what makes continued survival a possibility, especially when the terrain is as harsh as this area can be. Bear in mind, even the plants have to find ways to survive, so virtually every one of them has some form of thorny defense. The cactus are not the only things down here that are protected in this manner. Plants with names like Snake Brush, Gray Thorn, Spiny Redberry, Boat-spine Acacia, and Prickly Poppy all reflect on the way the plants are armored for their own survival. 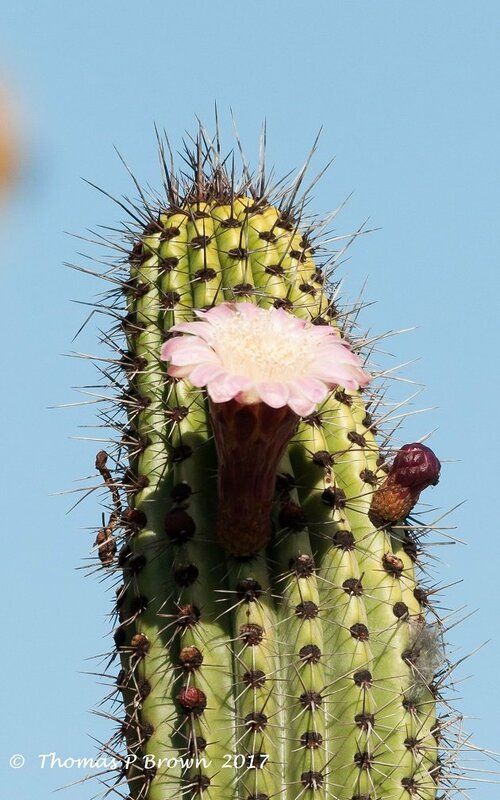 When it comes to a one stop shopping for food and shelter, no other plant is as widely used as the Cardon Cactus family. 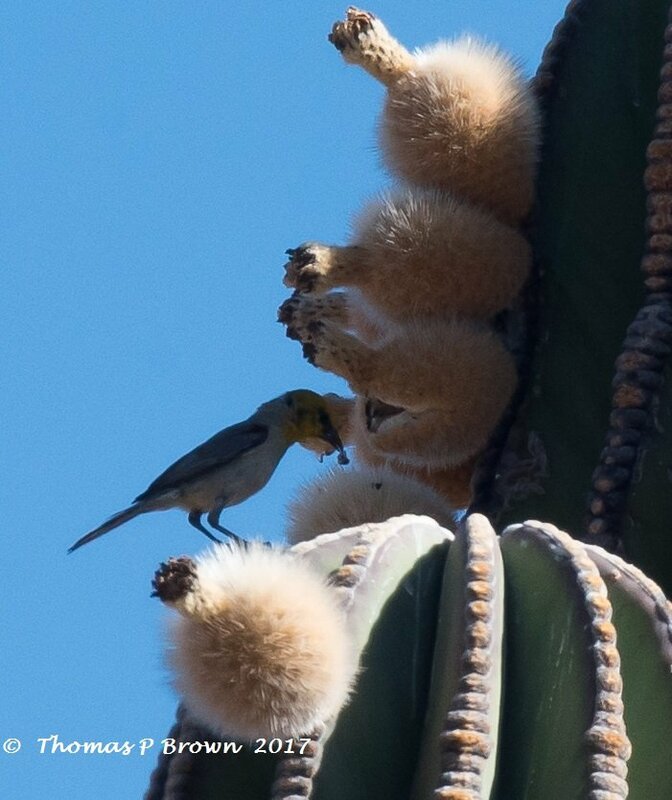 Members of the genus Pachycereus, there are a couple of species which are quite prevalent here on the southern Baja. The Aborigines Hairbrush, and the Elephant Cactus. The latter being known for its massive size, often over 15 meters tall, growing up to 10 tons in weight, and living for what is believed to be over 200 years! This is the bloom found on the Aborigines Hairbrush. 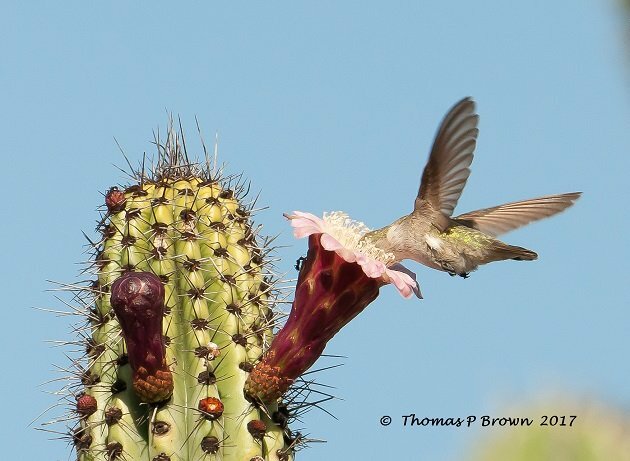 Here is a female Costa’s Hummingbird going in head first to get at the nectar. And this is the bloom for the Elephant Cactus. 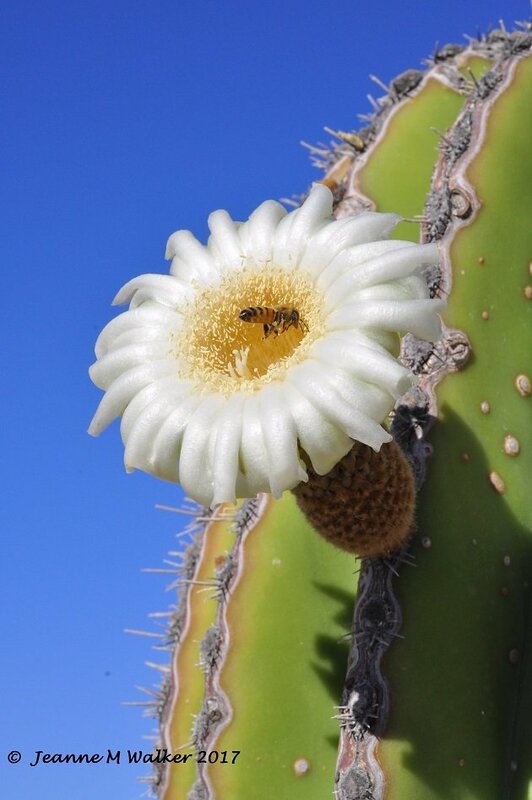 The Elephant Cactus, puts out a white tubular flower that open from late March, until early, June, and are visited by nectar feeding bats at night and many birds during the day. Once the fruit is ripe, it becomes a primary source for many species. 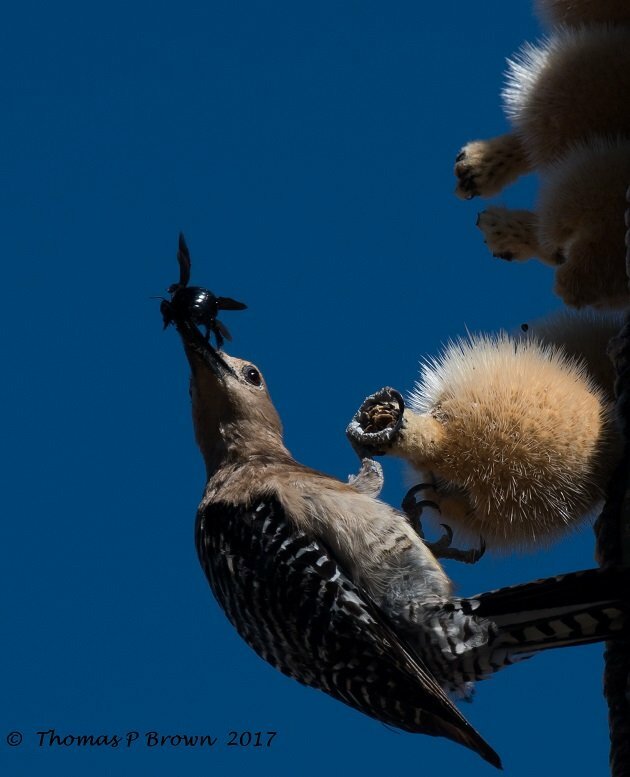 The larger birds will break open the round fuzzy balls to get at the white pulpy fruit and black seeds. Then, let the feeding frenzy begin! As you can see below, I have tried to document the action, and of course, like much of nature, the biggest eats first. 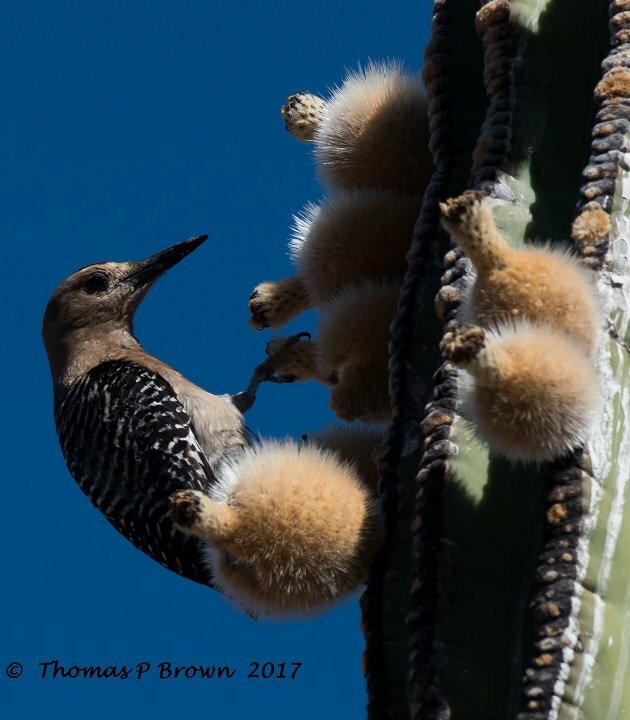 The Gila Woodpecker is the first to break the fruit open, gets it fill and moves on. Then the White-winged Doves move in. They are followed by a Northern Mockingbird. 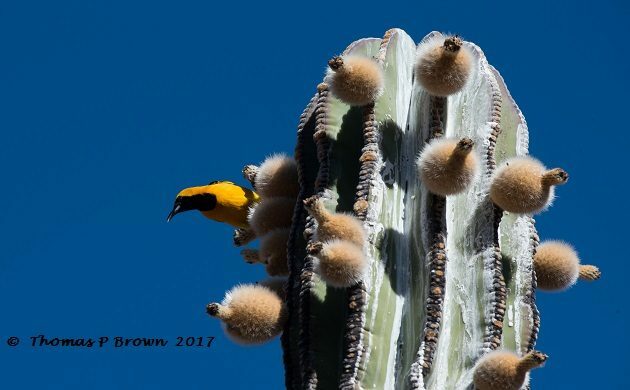 After the mockingbird is done, several Hooded Orioles descended upon the cactus blooms, and finally, the poor little Verdin got its chance to pick away at what ever is left. For the most part, this was all on one cactus bloom, and this cactus is well stocked, so this display will go one for quite a few days yet. 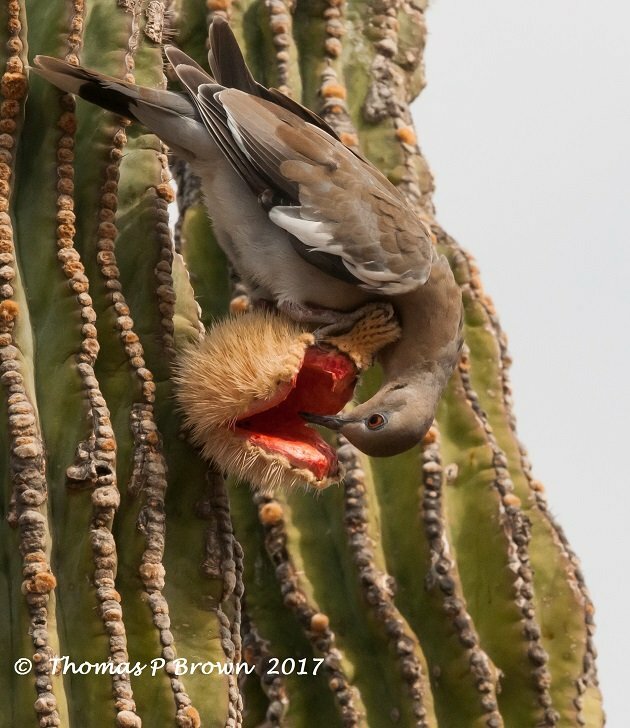 After the Northern Mockingbirds, and Hooded Orioles got their fill, seen in the feature photo above, the little Verdin got a chance. 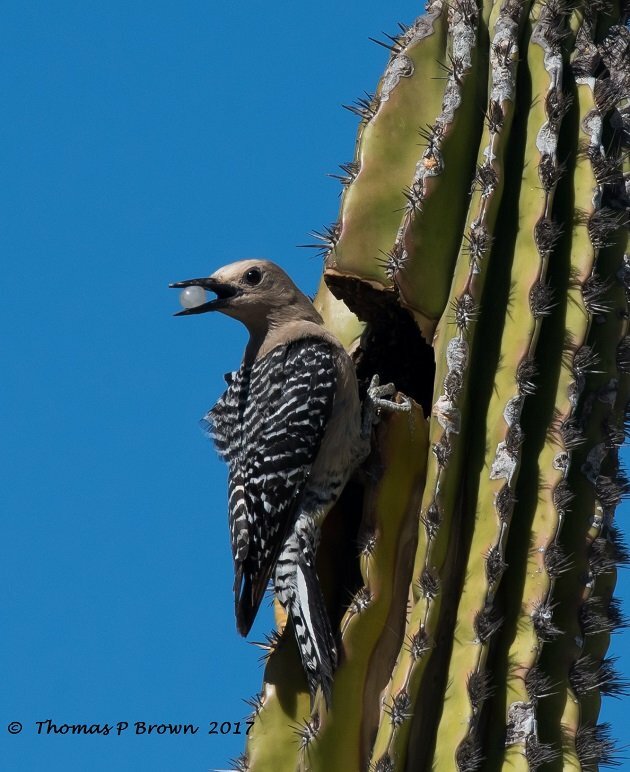 A few minutes later, the Gila Woodpecker was back, and in a was very excited. 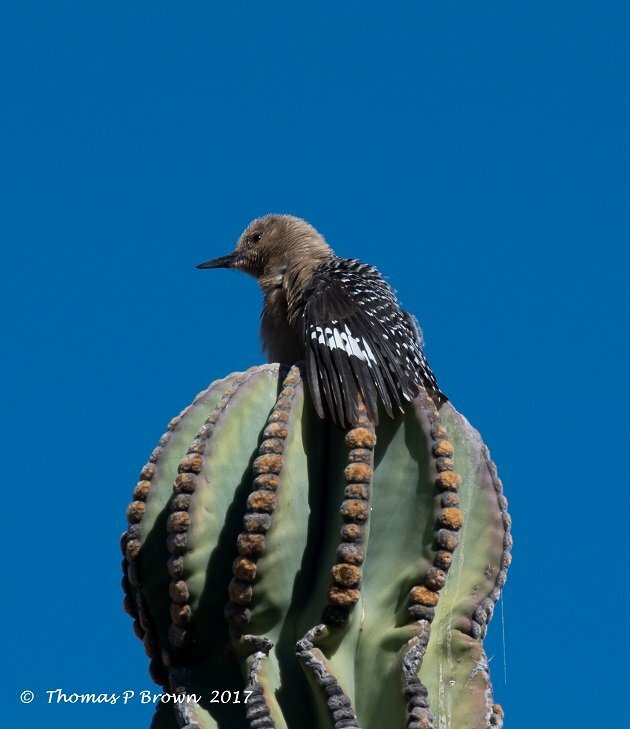 Calling and bouncing around the top of the cactus, it swooped down, dug its large bill into the bloom, and pulled out this huge black fly. It flew off before eating the fly, but I have to guess there is a little protein on the diet that day. 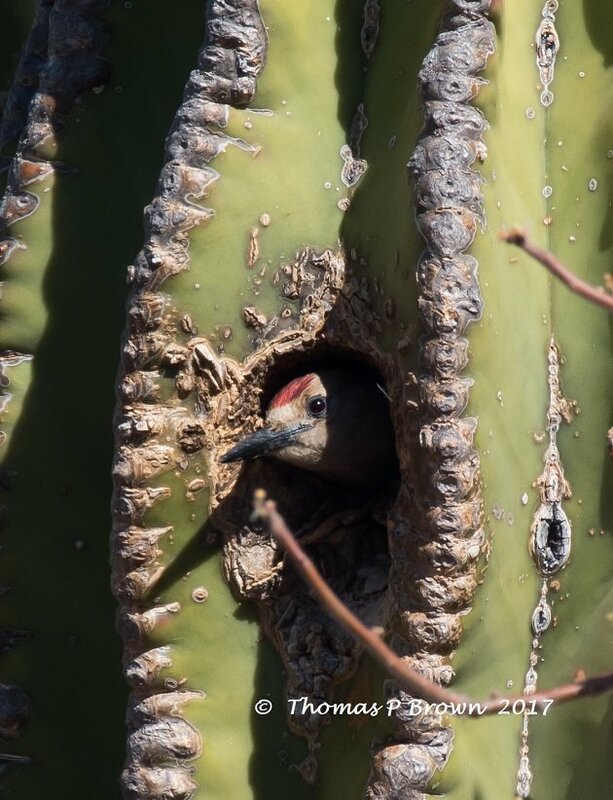 While all this was going on, I discovered that a couple of Gila Woodpeckers had located their nest in a cavity in the Elephant Cactus right next to the one getting all the feeding activity. The male came and went several times. 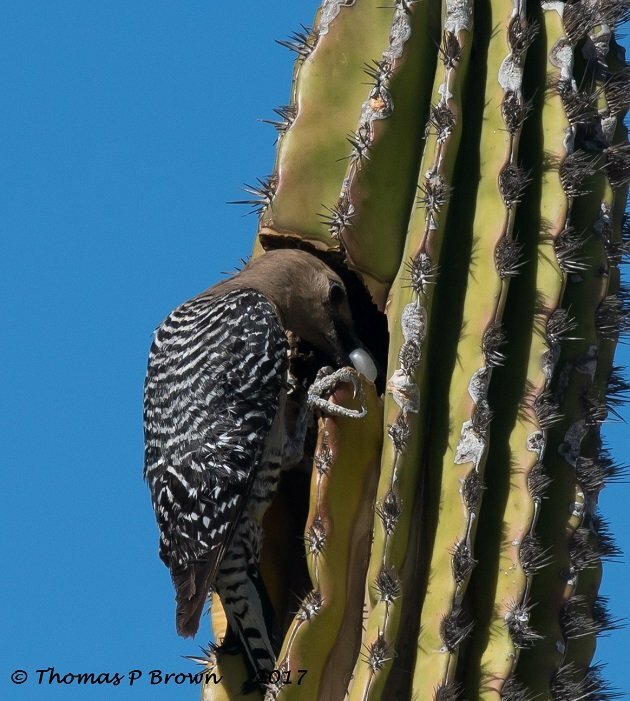 At some point the female landed right on top of the cactus that contained the nest, and let her wins droop down. I have never seen this before, so I am not sure if she was just hot and looking to cool off, tired, or this is a display of territory, and she was not in the mood to be messed with! She sat like this for about 10 minutes. 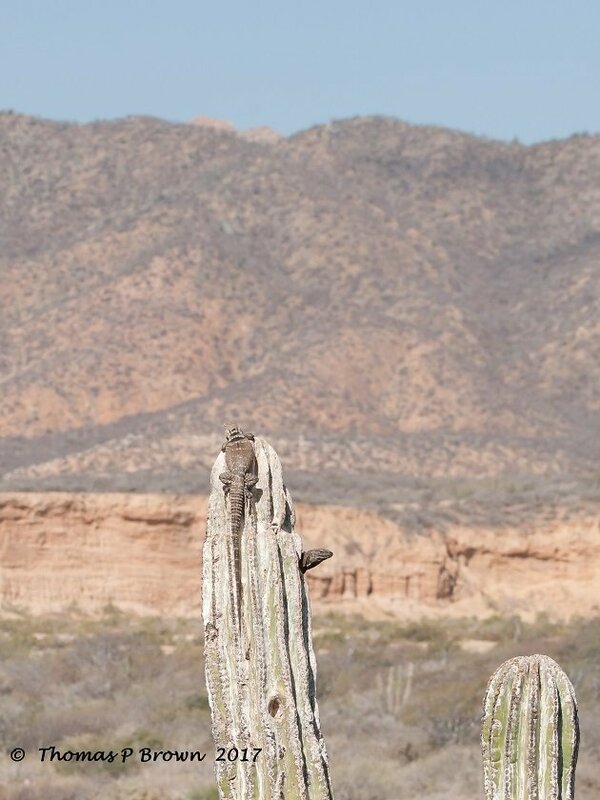 Just about a 100 meters from this Elephant Cactus, there is a Aborigines Hairbrush, with another pair of Gila Woodpeckers in residence. The female brought back this kind of white, translucent seed to the nest a couple of times, but as of yet, I have not been able to identify just exactly what it is. 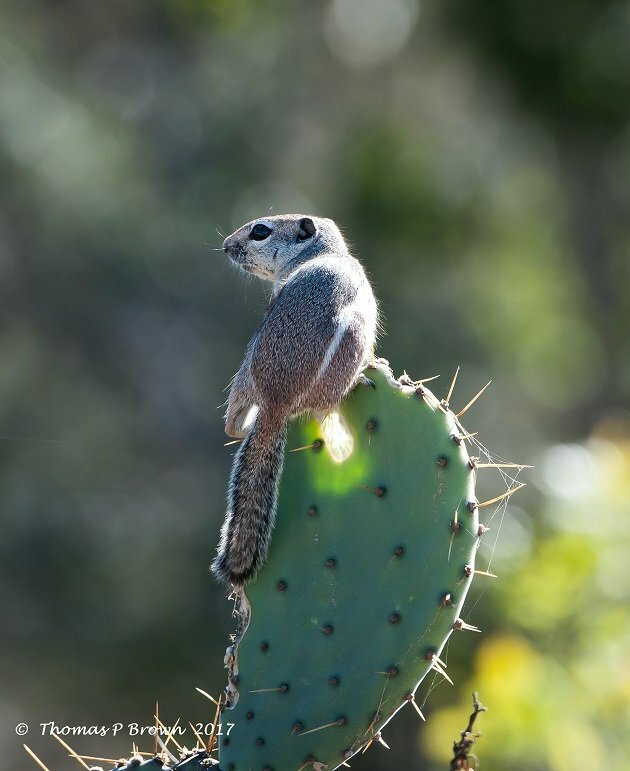 Our local Mexican Ground Squirrels are quite fond of the Chaparral Prickly Pear, or Nopal Cactus as it is called locally. 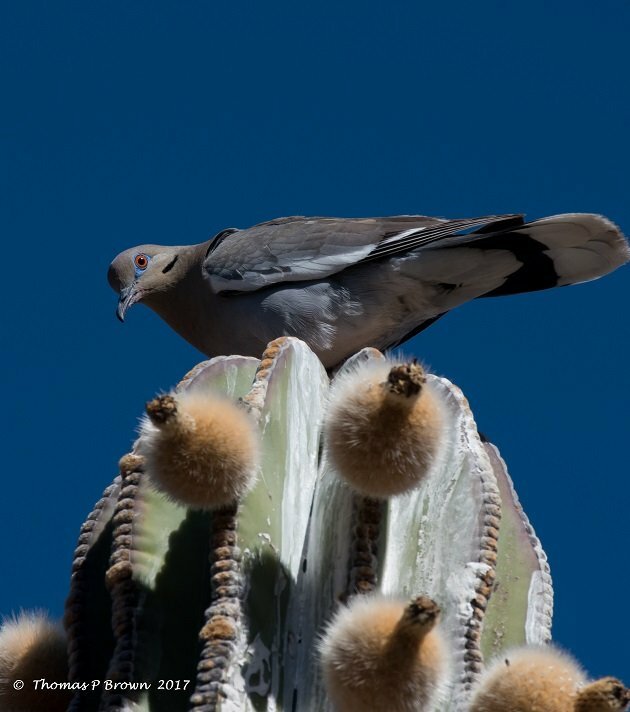 While the squirrels get both food and the water content from the cactus, the Nopal is a huge mainstay in nearly every local kitchen and restaurant in this part of Mexico. Used in many dishes, it is most popular in Mocahete, or stew that is given its name from the bowl carved out of lava type rock, and served piping hot. These old nest sites are often used by many species of birds, and a few things that are not birds. 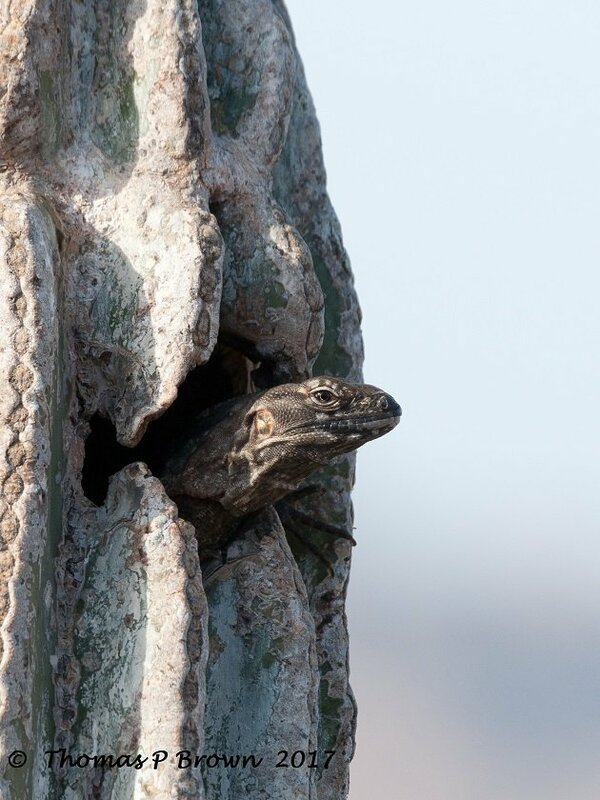 I discovered this pair of Spiny-tailed Iguanas had taken up residency in a very large, old Elephant Cactus.. They would stay inside until 9:30-10:00 AM, and then casually climb out and see what was going on in their area. This post is awesome. Good job, Tom! Thanks Corey! By the way, the white “Jellly Bean” seed is as of yet fully identified, but I have found out the locals call the plant “Otatave”. Of course there is no reference to that name anywhere in the world….The closest thing I have come up with is the Big-leaf Mistletoe – Phoradendrn serotinum subsp.. macrophyllum. 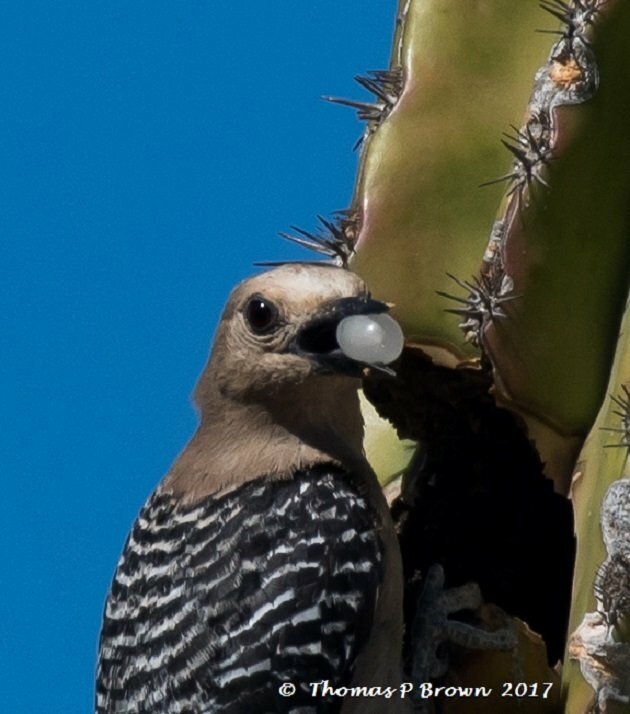 It is found here on the Baja, and has a similar seed. 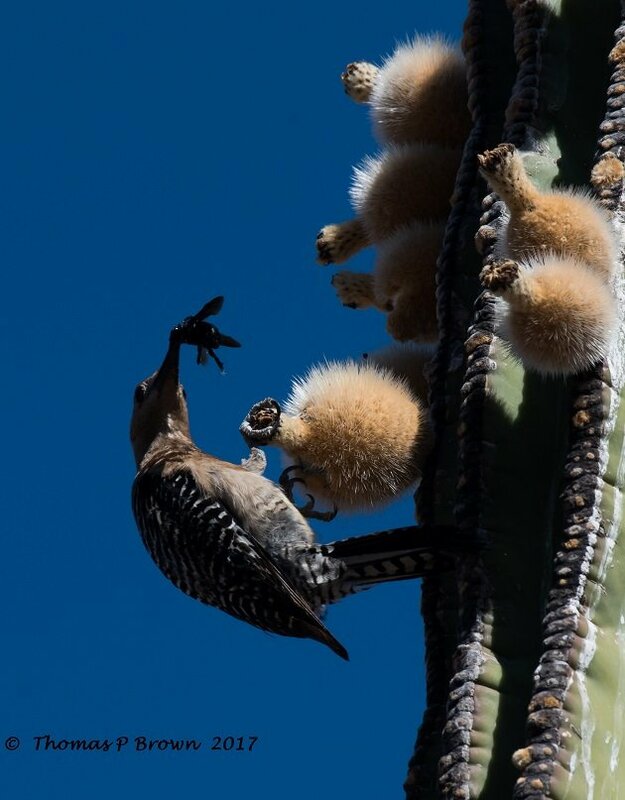 Great post-love the cactus and the birds! Clare…we might just have a winner!! I have to fly out to Seattle tjhis morning but will return mid week, and will go take a look to see if I can find the plant! Thanks for the help!